This article is not about William H. Jefferys, also both an astronomer and a Bayesian. 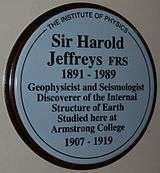 Sir Harold Jeffreys, FRS (22 April 1891 – 18 March 1989) was an English mathematician, statistician, geophysicist, and astronomer. His book Theory of Probability, which first appeared in 1939, played an important role in the revival of the Bayesian view of probability. Jeffreys was born in Fatfield, Washington, County Durham, England. He studied at Armstrong College in Newcastle upon Tyne, then part of the University of Durham, and with the University of London External Programme. Jeffreys became a fellow of St John's College, Cambridge in 1914. At the University of Cambridge he taught mathematics, then geophysics and finally became the Plumian Professor of Astronomy. He married another mathematician and physicist, Bertha Swirles (1903–1999), in 1940 and together they wrote Methods of Mathematical Physics. One of his major contributions was on the Bayesian approach to probability (also see Jeffreys prior), as well as the idea that the Earth's planetary core was liquid. He was knighted in 1953. By 1924 Jeffreys had developed a general method of approximating solutions to linear, second-order differential equations, including the Schrödinger equation. Although the Schrödinger equation was developed two years later, Wentzel, Kramers, and Brillouin were apparently unaware of this earlier work, so Jeffreys is often neglected when credit is given for the WKB approximation. 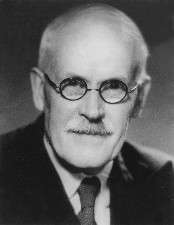 Jeffreys received the Gold Medal of the Royal Astronomical Society in 1937, the Royal Society's Copley Medal in 1960, and the Royal Statistical Society's Guy Medal in Gold in 1962. In 1948, Jeffreys received the Prix Charles Lagrange from the Académie royale des Sciences, des Lettres et des Beaux-Arts de Belgique. From 1939 to 1952 he was established as Director of the International Seismological Summary further known as International Seismological Centre. The textbook Probability Theory: The Logic of Science, written by the physicist and probability theorist Edwin T. Jaynes, is dedicated to Jeffreys. The dedication reads, "Dedicated to the memory of Sir Harold Jeffreys, who saw the truth and preserved it." It is only through an appendix to the third edition of Jeffreys' book Scientific Inference that we know about Mary Cartwright's method of proving that the number π is irrational. Like most of his contemporaries, Jeffreys was a strong opponent of continental drift as proposed by Alfred Wegener. For him, continental drift was "out of the question" because no force even remotely strong enough to move the continents across the Earth's surface was evident. As geological and geophysical evidence for continental drift and plate tectonics mounted in the 1960s and after, to the point where it became the unifying concept of modern geology, Jeffreys remained a stubborn opponent of the theory to his death. ↑ Roxburgh, I. W. (2007). "Hermann Bondi 1 November 1919–10 September 2005: Elected FRS 1959". Biographical Memoirs of Fellows of the Royal Society. 53: 45–61. doi:10.1098/rsbm.2007.0008. 1 2 3 Cook, A. (1990). "Sir Harold Jeffreys. 2 April 1891–18 March 1989". Biographical Memoirs of Fellows of the Royal Society. 36: 302–326. doi:10.1098/rsbm.1990.0034. ↑ "Errata: Sir Harold Jeffreys. 2 April 1891–18 March 1989". Biographical Memoirs of Fellows of the Royal Society. 37: 491–426. 1991. doi:10.1098/rsbm.1991.0025. ↑ Jaynes, E. T. (2003). Probability Theory: The Logic of Science. Cambridge University Press. ISBN 0-521-59271-2. ↑ O'Connor, John J.; Robertson, Edmund F., "Harold Jeffreys", MacTutor History of Mathematics archive, University of St Andrews . ↑ "Papers and Correspondence of Sir Harold Jeffreys". Retrieved 17 September 2008. ↑ Bolt, B. A. (1982). "The Constitution of the Core: Seismological Evidence". Philosophical Transactions of the Royal Society A: Mathematical, Physical and Engineering Sciences. 306 (1492): 11–20. Bibcode:1982RSPTA.306...11B. doi:10.1098/rsta.1982.0062. ↑ Igorʹ Vasilʹevich Andrianov; Jan Awrejcewicz; L. I. Manevitch; Leonid Isaakovich Manevich (2004). Asymptotical mechanics of thin-walled structures. Berlin: Springer-Verlag. p. 471. ISBN 3-540-40876-2. ↑ Lewis, Cherry (2002). The dating game: one man's search for the age of the Earth. Cambridge, UK: Cambridge University Press. p. 159. ISBN 0-521-89312-7. ↑ Uhler, Horace Scudder (1929). "Review: Operational methods in mathematical physics, by H. Jeffreys". Bull. Amer. Math. Soc. 35 (6): 882–883. doi:10.1090/s0002-9904-1929-04822-5. ↑ Struik, D. J. (1939). "Review: Scientific inference by H. Jeffreys". Bull. Amer. Math. Soc. 45 (3): 213–215. doi:10.1090/s0002-9904-1939-06947-4. ↑ Taylor, J. H. (1933). "Review: Cartesian tensors, by H. Jeffreys". Bull. Amer. Math. Soc. 39 (9): 661. doi:10.1090/s0002-9904-1933-05715-4. ↑ Dodd, Edward L. (1940). "Review: Theory of probability, by H. Jeffreys". Bull. Amer. Math. Soc. 46 (9, Part 1): 739–741. doi:10.1090/s0002-9904-1940-07280-5. ↑ Synge, J. L. (1948). "Review: Methods of mathematical physics, by H. Jeffreys and B. S. Jeffreys". Bull. Amer. Math. Soc. 54 (3): 300–303. doi:10.1090/s0002-9904-1948-08974-1. Galavotti, Maria Carla (2003). "Harold Jeffreys' Probabilistic Epistemology: Between Logicism And Subjectivism". British Journal for the Philosophy of Science. 54 (1): 43–57. doi:10.1093/bjps/54.1.43. (A review of Jeffreys' approach to probability; includes remarks on R.A. Fisher, Frank P. Ramsey, and Bruno de Finetti. Howie, David (2002). Interpreting Probability: Controversies and Developments in the Early Twentieth Century. New York: Cambridge University Press. ISBN 0-521-81251-8. Swirles, Bertha (1992). "Reminiscences and Discoveries: Harold Jeffreys from 1891 to 1940". Notes Rec. R. Soc. Lond. 46 (2): 301–308. JSTOR 531640. Photographs of Harold Jeffreys at Emilio Segrè Visual Archives, American Institute of Physics.